Personalise your Custom Travel Card Wallets with a double sided print of your brand-name and logo for maximum exposure and hand out to gain more public exposure! 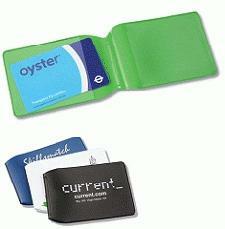 These travel card holders are specifically brilliant for the Oyster cards - mainly used in London's public transport services. Oyster cards are becoming widely popular with over 34 million oyster cards issued in the last 4 years - it's a growing trend! Why not customise these Custom Travel Card holders and join that trend by getting your Company name about? For a FREE QUOTE, please fill in the form regarding our Custom Travel Card Wallets and we'll be able to help you. Why not have a look a our Promotional Gifts department for more excellent promotional products.